Before even shopping for that perfect cruise, it will be helpful to dispel any myths or misconceptions you have about cruising. Travelers new to cruising have used many excuses as to why they have never cruised before. They are often based on these misconceptions. Misconception #1: Won't I get seasick on the cruise? Most cruise ships are so big and stabilized that you don't even know you are moving. This is especially true in the calm waters of the Caribbean and Alaska's Inside Passage. The latest technology helps them navigate and outrun hurricanes and other bad weather. If you do happen to pass through some rough water, any queasiness can usually be relieved by over the counter medication such as Dramamine or Bonine. The purser's deck on most ships can provide an emergency ration. If you are prone to motion sickness, ask your doctor about the Transderm patch that is available by prescription. Acupressure wristbands strapped on before you embark or ginger caplets may be an alternative to drugs. If you are still nervous about getting seasick, try picking the larger ships. Ships weighing over 50,000 tons provide more stability than the smaller ones. Even better than those are the ships that are over 100,000 tons. For example, the Carnival Conquest or the Royal Caribbean's Voyager of the Seas or Explorer of the Seas are in this class of ship. The first few days at sea, eat very light. It is important to remember to eat something light the minute you feel queasy. Above all, it is important to know that even if you do get seasick, it will more than likely be just for a short time. Your body will acclimate to the steady moving of the ship and you will be eating as much of that delicious and rich food as you want. Misconception #2: Isn't a cruise expensive? Cruising is more affordable than ever, but it is hard to understand that when at the first glance of the price. It is important to remember that your cruise fare includes accommodations, as much food as you can eat, and some activities. Activities included are the children's programs, nighttime entertainment, and most activities held on the ship throughout the cruise. Some cruise lines will package in reduced rate airfare and transfers. When you add all of that up, it could be cheaper than a land based vacation. You will still have to watch out for additional costs that could add up during your cruise. This could be anything from alcohol and shore excursions to souvenirs. Each cruise line varies in what is included in the original costs so be sure to check before you indulge in that tenth soda for the day! Everyone knows the rumors about gaining weight on a cruise. It is said that you can measure the cruise by how much weight you gain. 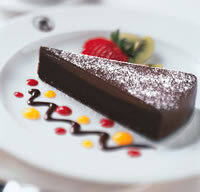 For anyone who is watching their weight, be assured that the cruise lines have a menu for you. Low-fat, low-carb, trans-fat free… it is generally all available. If you are still concerned, head up to the gym to work out or jog around deck. Forget the elevators that always take too long anyways, and head up the stairs. There are also several aerobic activities to do in port like hiking. It is important to note that even though it may seem like a ton of food, the portions are generally healthier and smaller than what you would receive in a typical American restaurant. So don't worry about indulging in that decadent chocolate soufflé… chances are you'll burn the calories before dessert the next night! Misconception #4: I'll be Bored! No matter what entertains you, you will find something to do on today's cruise ships. There is always something going on especially when the ship is at sea. Head to the deck with a good book and soak in the sunshine. Take a dip in the pool. Indulge in a massage at the spa. Shop for souvenirs in the duty-free shops. Listen to guest speakers or attend a wine lecture. Try your luck at the casino or a round of bingo. Watch a movie. Learn the art of the cute towel animals. Play a game of basketball or visit the gym. The list goes on and on and that is just during the day. At night, the ship comes alive with extravagant dinners, Las Vegas style shows, comedians, night clubs, and piano bars. 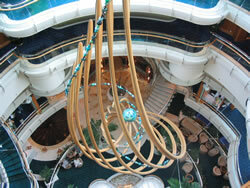 There are so many activities on the ship; it may be difficult to get to everything that you could possibly want to do! Remember that you won't be on the ship all of the time. The ship will stop at enticing ports where there are numerous activities to choose from whether you decide to explore on your own or purchase a shore excursion. Misconception #5: Isn't cruising for the honeymooners or blue hair generation? That may have been true at one time but cruise ships are increasingly targeting families. Kids' camp and programs rival any on land. Singles are entertained with numerous activities, shows, and thrilling nightlife. Cruise lines offer varying lengths of itineraries for those who can't afford to take a longer cruise or don't have much vacation time. It just might be the weekend away that you are looking for! Misconception #6: Are all ships the same? Cruise ships are much like makes and models of cars. There is something for every taste and lifestyle. With big ships, small ships, luxury ships, family ships, ships for singles, and ships that will take you on expeditions, the possibilities are endless. Find your favorite style or try new ones! Cruise ships venture all across the world visiting some 1,800 ports. Ships vary in size from the intimate expedition ships to the mega cruise liners. Deciding what kind of ship to sail on, where to go, and cruise length are important factors in assuring an enjoyable cruise vacation. There are several things to consider when choosing the perfect cruise. Do you like to spend time on the beaches while on vacation? Would you rather dig into history or experience the wildlife and scenic views? Do you want to stop at a different port every day or would you like a few peaceful days at sea? Will you spend your time on the ship dancing and partying at the clubs or would you rather retreat to a ship known for it elegance and refinery? Are you looking for a quick weekend getaway or are you looking to escape for several weeks? There is not one cruise that everyone should do first. You should find the one that is perfect for you based on your personal preferences and style. Many first timers choose the Caribbean or Mexican Riviera. The itineraries tend to be one week or less. 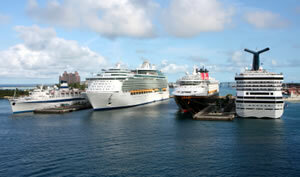 Cruise terminals are located in Florida and California as well as in New Orleans, Baltimore, New York, and Galveston. 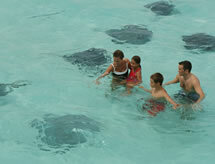 Most of these cruises include at least one day at sea between the island paradises. After finding that perfect itinerary and cruise, you will have to consider what type of stateroom you want to stay in. It is again based on personal preference and style. If you plan to only be in your cabin for sleeping, then you may just want to book an inside stateroom. If you can't imagine a cruise without enjoying a cup of morning coffee on your private veranda, then that is okay, too. Oceanview accommodations are available with different size windows. Be sure to pay attention when booking as some oceanview staterooms have obstructed views. You might wake up to the beautiful view of a bright orange lifeboat outside your window instead of the passing scenery. Different sizes and sleeping arrangements are available in each of the stateroom types. The easiest way to find the perfect ship is to use our cruise search engine. Click here to explore! You will receive documents from the cruise line either in the mail or electronically a few weeks before you cruise. These documents will have everything you need to get on the ship. Be sure to fill out any necessary forms before you arrive to check in. Some cruise lines now allow you to fill out the forms online and print them out to take with you. Make sure your passport is up to date. See Required Documents for the latest passport requirements. If you are flying to the cruise terminal, plan to arrive at least four to five hours prior to the ship's departure on embarkation day. If possible, try to arrive a day before. These are true even if you are driving to the pier. Factor in all possible delays and transportation glitches that could delay getting you to the pier on time. The cruise ship will not wait on you. If you book a flight through the cruise line, it may be arranged to get you to the next port of call possibly at your expense. If you book the flights on your own, there will be no refund. That is one of the reasons why it so important to look into purchasing travel insurance for your vacation. Spend some time researching your ship and the ports so you know what to expect before you arrive. It might be useful to you to study the ship layout and map before you arrive so you don't waste too much of your coveted time wondering how to get to the spa. Many cruise lines offer opportunities to look through the list of shore excursions and pre-book the ones you want. This helps with the initial rush once onboard and guarantees that it won't be sold out. Appointments may also be made for spa and salon treatments. Many of the newer ships offer specialty restaurants that may require reservations. Those can generally be booked before you go as well. Try to pack as light as possible. See Packing Tips and Lists for more details and a suggested packing list. Attach your luggage tags that are provided by the cruise line. These tags will allow the porters to get the bags from the cruise terminal to your stateroom. It is also beneficial to tie on a distinguishable piece of ribbon or fabric to each bag. This helps in identifying which bags are yours more quickly. Be sure to pack anything that you may need that day including all documents, passports, medicine, etc. in a day bag that you will take with you. Don't worry if your bags aren't there the moment you arrive to your stateroom or if they don't arrive together. You will receive them all by the end of the day. The dress code for dinner on that first night tends to be a bit more casual because they understand that you may not have your bags by that time. The exciting day has arrived! What to expect on this first day may be a little overwhelming. When you arrive at the cruise terminal, there will be port authority personnel around to help you get exactly where you should be. There are several check-in lines in the terminals. There will generally be a line for international guests, one for concierge passengers, an accessible line, and others that are specific to the individual cruise lines. Once onboard, get acquainted with your ship. Take some time to explore and learn the layout. Lunch will be served during the afternoon. You will find out the exact times and location when you check-in. Book any other appointments that weren't booked at home. To know what is going on each minute of every day, check your ship's daily newsletter that is delivered to your stateroom each day. About one hour before sail away, there will be a mandatory muster drill, also known as a lifeboat drill. It is merely a drill so passengers and crew know the procedure in the unlikely event of an emergency. Everyone is required to participate. Your name will be checked off a list and your cabin will be checked during the drill. Anyone who does not participate is subject to a muster drill very early one morning during your cruise. Instructions and your muster assembly station are posted in your cabin. Several announcements will be made prior to the drill and the ship's staff will be stationed throughout the ship showing you where to go. Don't forget your lifejacket when you go! After the drill, return to your stateroom to put away your lifejacket and then head up to deck! Be sure not to miss the excitement of sail away. There is nothing like it! Even if your luggage is at your cabin, drag it inside and leave unpacking for later. Although cruises are billed as an all-inclusive vacation, there are some “hidden” costs that could rack up a very large bill at the end of the week. On the luxury lines, alcohol may be included in the original cruise cost. It is not on most cruise lines, however. 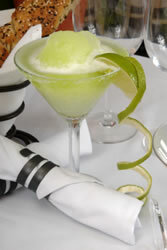 Be careful when ordering drinks, especially on deck, as they will try to sell you one in a souvenir glass that costs more than one in a regular glass. You can ask for drinks in a regular glass if you don't want to pay for the souvenir. Other hidden costs include shore excursions, spa services, the casino, laundry services, and tipping. It is important to check with your individual cruise line, as some of these services may be included where as others are not. 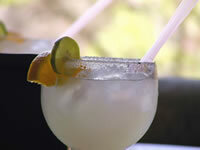 Some cruise lines charge for individual sodas but will offer an unlimited plan. Think about how many you plan to drink during the course of your cruise and weigh the value of purchasing the plan against purchasing individual drinks. On cruiselines where sodas are included in the original cost of the cruise or in the plan, these may not always be applicable in certain areas on the ship. For example, Disney Cruise Line® offers unlimited sodas on deck and in the dining rooms but there is a charge if one is ordered anywhere else on the ship. Cruise lines typically operate on a cashless system. You will receive a swipe card when you check-in that usually doubles as your room key. This card will be used for charging various items and services to an account. You can place a credit card on the account for all purchases made with the card or you can opt to settle at the end of your trip with cash. If you plan on using your credit card in another country, it might be wise to notify the credit card company of when and where you will be going. This will avoid a hold being placed on the card. If you are sailing on a ship with assigned seating times and tables, you will receive confirmation of your assignment either before you sail or when you arrive in your stateroom. If there are any problems, see the maitre d' on embarkation day to request a change. Even if you have assigned seating, you don't have to eat in the dining room every night. There are several options that you can choose from the ship's buffet to hot dog or pizza stands to specialty restaurants. There is also room service that is generally available 24 hours a day. Discuss with the cruise line or your travel consultant four to six weeks prior to departure any special dietary requests that need to be made. There shouldn't be a problem making accommodations especially if they know about it in advance. Low-salt or low-cholesterol food requests can typically be accommodated right onboard. Your cruise director will typically host a session that will let you know everything you need to know about a particular port. Check your daily newsletter for specific times and location. It is important to attend these especially if you plan to venture out on your own (not on a shore excursion). You may also receive a separate newsletter about the day prior about that particular port, maps, shopping venues, etc. Find your adventure in a port with a shore excursion, a one-day tour offered in various port cities. Whatever your idea of adventure or entertainment is, there is something for you to do in each exciting port of call. An excursion is a great way to enhance your cruise experience and to see so much more of the ports during your cruise. The key to getting what you want is to book early! Some cruise lines allow for guests to reserve shore excursions online prior to departure. If you don't or can't book online, be sure to get to the shore excursion desk as soon as it opens on the ship. Popular shore excursions sell out fast! Be sure to read any fine print before signing up. Cruise lines vary on their policies of changing or canceling an excursion. Gratuity policies vary widely by cruise line. Some are included in the fare and others provide envelopes at the end of the cruise for you to give to the respective crew members. Be sure to check the line's policy so you know what is expected. See Tipping on Cruises for a list of some of cruise lines and their policies. On the last night of your cruise, you will receive an itemized bill of your charges. Take a minute to look over it. If you placed a credit card on the account, contact the purser or hotel desk to dispute any charges if necessary, otherwise just keep the bill as a receipt. The balance will be charged to the credit card you provided before you got onboard. Some lines may allow you to settle your account in cash at the end of the cruise as long as a deposit is placed prior to embarkation. Many cruise lines require you to pack your bags the night before you disembark and place them outside your stateroom by a certain time to be collected. This expedites the disembarkation process and prevents you from having to carry them around the next morning after you vacate the stateroom. Be sure to pack anything you will need the next morning in a carry on including a change of clothes. Many have been seen leaving the cruise ships in their pajamas! You will receive new luggage tags to place on your bags. Be sure to remove the old cruise line tags! This is where the bright colored ribbon or fabric really comes in handy. 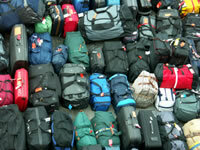 Many times all the bags are thrown into piles based on which deck your stateroom was located. If you can spot that distinct piece of fabric tied to you luggage, it makes the process a little easier. 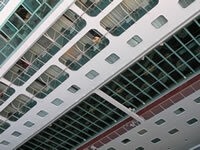 Each cruise line, each ship, each cruise terminal varies in how the disembarkation process is carried out. Your cruise director will typically give a talk generally the day before to explain this process. It is recommended that at least one member of each group attend. The presentation may also be played on your stateroom television throughout the day. You have made it to the end of your first cruise. Don't be surprised for the overwhelming symptoms of addiction. Most people who try a cruise once will become repeat cruisers. Just think how much more you will know the next time you go!